Home » Who is going to be awake? Who is going to be awake? I have a neighbor with a bumper sticker on his truck proclaiming, "Vehicle ready for the Zombie Apocalypse." Advent begins this year with a plea to be ready for the Jesus Apocalypse. The day is coming when we will see the Son of Man coming in clouds with great power and glory. The question Jesus asks is will you be ready? Many people skip the apocalyptic passages of the Bible. Historically, religion in America cycles through periods of high apocalyptic awareness about every fifty years. 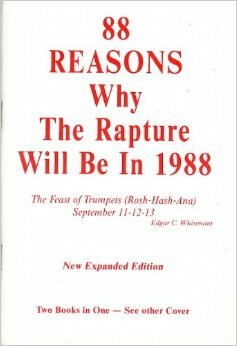 The most recent peaking being thirty years ago, as captured in the book title, 88 Reasons Why the Rapture Will Occur in 1988. These times are always followed by decades of exhaustion, when main line churches forsake the Book of Revelation like it was the actual plague, not just the messenger. Popular culture takes up the banner that religion drops, so we have Y2K, the Zombie Apocalypse, and the tragic over-response of the Bush administration to 911. This leads me to wonder if our failure to consistently incorporate eschatology into our personal theology won’t have real consequences. Why do we fail to involve our church in saving the planet? What if our lack of concern about Global Warming is related to our dismissal of all apocalyptic thinking? In Mark 13 and Matthew 24, where Jesus speaks apocalyptically, he is providing useful advice to his hearers about their response to the coming Zealot rebellion and the fall of Jerusalem (70 AD.). He says, “ “When you see ‘the abomination that causes desolation’[a] standing where it[b] does not belong—let the reader understand—then let those who are in Judea flee to the mountains” (Mark 13:14). These words may have saved the early church from being destroyed. Other passages in the New Testament warn the faithful not loose heart when popular culture turns against them and they are persecuted for what they believe. This message may be relevant today. The whole enterprise of putting end-time prophesies into a time-line is ill fated, and thankfully, not often practiced today. The points that the Bible teaches are: 1) That national trauma always comes when you least expect them. 2) The world will end sooner than we think. 3) History is under God’s control. 4) Use your head, not your heart, when preparing for disaster. 5) Faithful people behave compassionately under even the worst circumstances.